A league-average hitter swings at about 46% of the pitches he sees. That much hasn’t really changed over at least the last decade. Roughly 5% of the time, a league-average hitter will end up in a 3-and-0 count. Roughly 7% of the time, a league-average hitter will swing at the next pitch. There’s nothing inherently wrong about swinging in a 3-and-0 count — the pitcher, often, will try to throw something straighter and over the plate. Often, then, there’s potential damage to be done. But a good deal might be learned about a hitter by examining his behavior in 3-and-0 counts. You can get a sense of a hitter’s eye, and you can get a sense of a hitter’s passiveness. Or, you might prefer, pickiness. Joe Mauer is far from a league-average hitter, in both results and approach. For his career, Mauer has swung at about 37% of the pitches he’s seen, and last year he had the lowest swing rate in baseball. He swung at just about 8% of all first pitches, tied for the lowest rate in the league and against an average of 27%. Of all of Mauer’s career plate appearances, 9% have proceeded to a 3-and-0 count. In 3% of those plate appearances did Mauer offer at the next pitch. Joe Mauer has the eye to swing 3-and-0, but Joe Mauer has not often swung 3-and-0. Mariners manager Eric Wedge summoned lefthander Lucas Luetge, who quickly fell behind in the count 3-0. Mauer had the green light, but he opted not to swing at a sinker down the middle. On 3-1, Luetge threw a slider for strike two. On 3-2, Luetge missed low with another slider, and Mauer took his walk. That loaded the bases for Josh Willingham, but Wedge brought in closer Tom Wilhelmsen, a righthander with filthy stuff. Willingham flied out to right field, ending the inning, and the Mariners wound up winning in their half of the ninth. I didn’t have time to ask Mauer about his plate appearance, but I’m just going to say this: He has to have more urgency to swing the bat there. By walking to load the bases, Mauer put Willingham in position to drive in a run with a hit, a walk, a hit-by-pitch, or an error. Mauer did more good than harm, but if the 3-and-0 pitch was right down the middle, you can see why one would wish for Mauer to be aggressive. He has such a sweet, beautiful swing — why not put it to greater use? Over the years, plenty of things have frustrated Twins fans. This, on occasion, has been one of them. Mauer just does not like to swing in 3-and-0 counts. You figure, if Joe Mauer swings 3-and-0, the pitch has got to be just about perfect. So grooved, so hittable, that even Joe Mauer can’t let it pass by. Mauer swung at three 3-and-0 pitches in 2005. Then three in 2006, then one, then three, then two. Then it was 2010, and Mauer didn’t swing at a single 3-and-0 pitch. 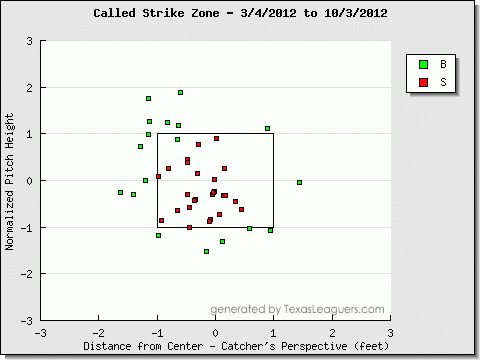 Then it was 2011, and Mauer didn’t swing at a single 3-and-0 pitch. Then it was September 2012, and Mauer hadn’t swung at a single 3-and-0 pitch. On September 20, there took place a rather pointless game between the Twins and the Indians. It doesn’t matter who won; the Twins ended the day 62-88, and the Indians also ended the day 62-88. In the top of the fourth inning, Mauer batted against Corey Kluber, with Ben Revere having led off with a single. 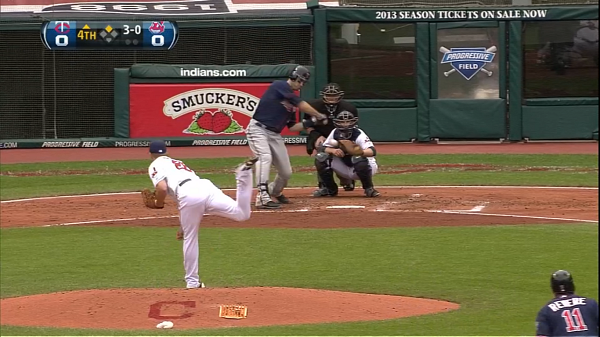 After ball one, Kluber tried a pickoff attempt. After ball two, Revere stole second. Then came ball three, and Mauer reached a 3-and-0 count. Mauer, as noted, is no stranger to 3-and-0 counts. But he hadn’t swung in a 3-and-0 count since July 18, 2009, in a plate appearance against Jason Jennings. So it had been more than three full years. Mauer’s disciplined enough to be given the green light, as he can tell the difference between a strike and a ball. But Mauer likes walks, and he doesn’t like ceding a hitter’s advantage by letting the pitcher off the hook. For Mauer to swing 3-and-0, conditions would have to be special. Conditions, on September 20, must have been special. Revere had just earlier gotten ahead 3-and-0, and Kluber threw him a 90 mile-per-hour fastball right down the heart of the plate that Revere took. Mauer might’ve had that in mind when Kluber threw him a 91 mile-per-hour 3-and-0 fastball. The pitch was over the plate, and above the knees, and Mauer uncharacteristically pulled the trigger. There was a run to drive in, and a hittable pitch on the way to the plate. Mauer didn’t want to let pitchers think they could always get away with a 3-and-0 meatball. Every so often you have to keep the opposing pitchers honest, and this gets into matters of game theory. Mauer, presumably, wasn’t thinking in terms of game theory at the time. Mauer, presumably, was thinking he saw a hittable fastball, and he wanted to hit it, damn the chance of drawing a walk. Welp, hitters aren’t perfect. Not even the Joe Mauer hitters. For the first time in more than three full years, Joe Mauer swung at a 3-and-0 pitch. He swung with a runner in scoring position, just like people have wanted him to do, and he pulled the ball on the ground harmlessly to second base, leading to the first out of the inning. The runner did advance from second to third, but the whole idea behind Joe Mauer isn’t exactly that he’s a reliable source of productive outs. It’s that, relatively speaking, he isn’t often a source of outs. In the top of the eighth inning, Mauer got ahead 3-and-0, and he wound up drawing a walk. Over what little of the season remained, Mauer wouldn’t swing 3-and-0 again. He isn’t likely to do it very often going forward. Sometimes, hitters have success swinging 3-and-0. Last season there were 30 3-and-0 home runs, and 50 3-and-0 extra-base hits. But there are also too many 3-and-0 outs, and so Mauer’s approach isn’t necessarily the wrong one. It can be frustrating to watch a 3-and-0 meatball pass by unchallenged. It can also be frustrating to watch a 3-and-0 delivery turn into a grounder. There is an argument, to be sure, over whether or not Joe Mauer is too passive at the plate. But, personally, I’m going to assume the guy with the career .323 average and .405 OBP has things pretty close to being optimized. We hoped you liked reading Joe Mauer Swings Away by Jeff Sullivan! Assuming the batter knows a pitch is a strike, the question is whether the value of swinging 3-0 is greater than the value of the rest of a 3-1 at-bat. Maybe that could be investigated given various pitch locations. I have no doubt the value of swinging at a center-of-the-zone 90 mph fastball with runners on is greater than the value of a 3-1 count.